A 3D motorcycle simulation action game. Is there a better alternative to Dirt Bike 3D? Is Dirt Bike 3D really the best app in Action category? Will Dirt Bike 3D work good on macOS 10.13.4? Dirt Bike is a motorcycle simulation action game. 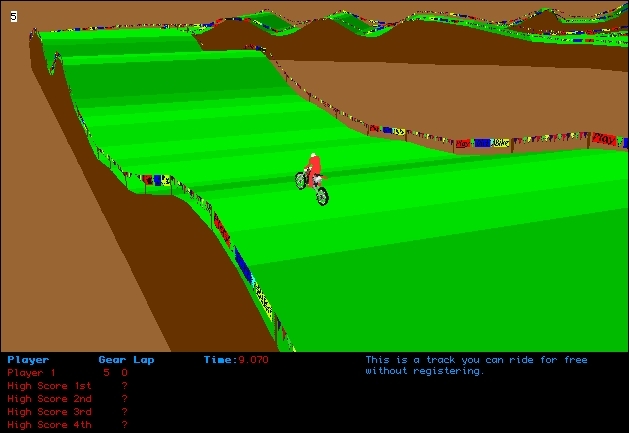 Using complex physics, it very accurately simulates a Dirt Bike being ridden over various terrain. You design the bike and control the throttle and shifting to race against other players, computer controlled bikes, and previous high scores. Registered users can create tracks of any shape including huge jumps, hill climbs, motocross, trials courses, drag races, half pipes or anything else you can imagine. Motocross riders love this game for it's riding realism. Version 1.9 adds support for MacOS X.
MacOS 8.0 or later, OpenGL 1.1.2 or later, CarbonLib. Dirt Bike 3D needs a rating. Be the first to rate this app and get the discussion started!